With the end of the year comes the usual "Year in Review" posts proliferating on your favorite fly fishing blogs. Mine is no exception. This is a long running tradition that I try* to accomplish every year, not for my readers but for myself. Not everyone is able to enjoy the adventures that I experience on a yearly basis, and reliving those moments reminds me of how blessed I truly am. If you are interested in catching up on some previous years' posts, here are a couple of my favorites. Just looking over those two posts reminded me of the great times I've had. I'm also reminded of the tough times. Checking the archives reminded me that I did not do a year in review for 2013. That probably has something to do with a transition back to TN from Colorado and career change. Regardless of how exciting that can be, it also comes with a lot of stress and difficulty. Thankfully, 2015 has been a very good year, both for the second year of my new venture as a fly fishing guide, and also for my own fly fishing and exploring opportunities. Early in the year, I had one of those memorable days of streamer fishing that every streamer junkie dreams about. As it turns out, that would be a precursor of things to come. As the winter continued, the early pleasant weather of December and January gave way to some of the nastiest winter weather. Not one but two ice storms pounded the Cumberland Plateau. In between the crazy weather, I did manage to enjoy some time on the Hiwassee and experienced first-hand how successful the delayed harvest has become. Once the ice hit, we were knocked out of business for a while. With electricity (and Internet) out for 10 days, I returned to the days of the pioneers. Turns out that is not necessarily a bad thing! I got to bed early every night (what else was I going to do? ), building up strength that was then spent cleaning up from the general devastation. 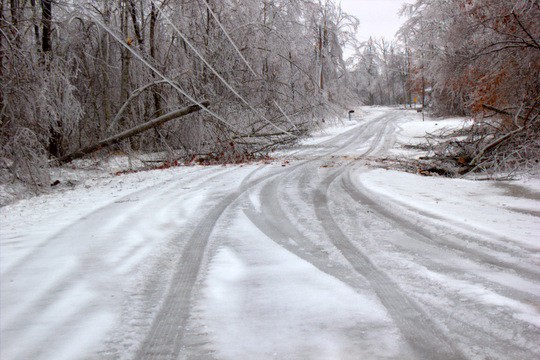 We're still seeing and hearing limbs coming down from the ice storm. 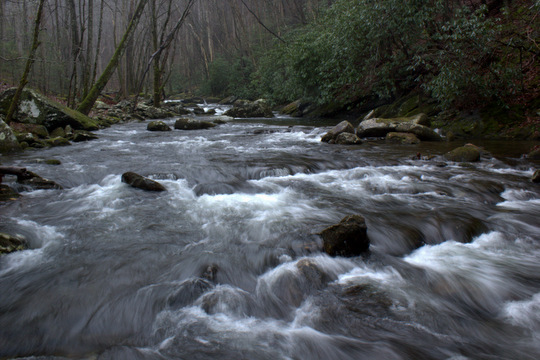 As we rolled into March, some of the biggest news of the year happened, at least if you were a Smoky Mountain fisherman: Lynn Camp Prong was opened after a multi-year closure to restore the native southern Appalachia brook trout. There are still way too many people fishing that stream for my taste, but another year or so should fix that as people get it out of their systems and move back to trying other equally good (or arguably better) waters. Also in March, I added a new state to my list of places fished. A pleasant trip down to South Carolina to see my cousin gave us time to catch up and get some much needed spring fishing in. 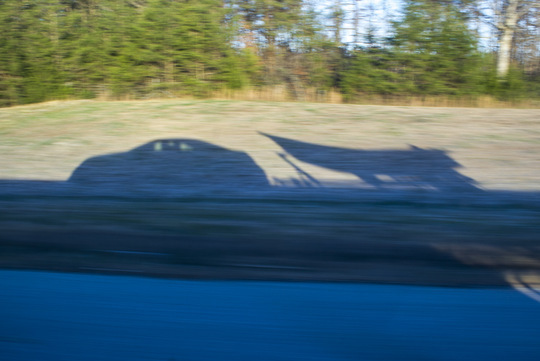 Tennessee was still trying to catch up from the cold weather and our spring hatches were a bit delayed. In South Carolina, I found both bugs and rising trout although most fish were caught subsurface. 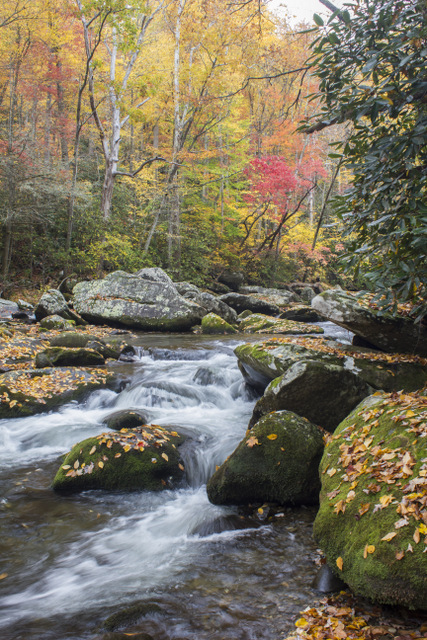 Shortly thereafter, I managed to sneak away for a day of brook trout fishing in the Smokies. This turned out to be one of my favorite days of fishing for the year. Admittedly, I do have a few of those. Another was soon to come in fact. Squeezing a fishing and camping trip around a guide trip, I managed to fish more new water (I did that a LOT in 2015!). This time it was a trip over to the North Carolina side of the Park. Not only did I get in some streamer fishing (there's that theme again! 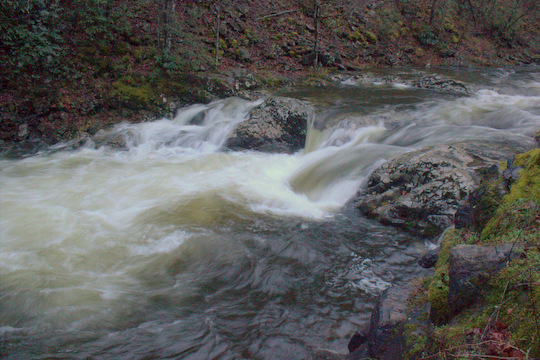 ), but I hiked up a stream that I had wanted to fish hard for a while and had a banner day. Guide trips were in full swing by the end of April and we were seeing hatches complete with rising trout nearly every day. Not just a few bugs here and there, but lots of bugs across all of the streams fished. Important lessons were learned in the process as the fish become just selective enough that you actually needed to have more or less the right bug on the end of your line. May continued with more of the same great fishing and catching. Two highlights in particular stand out for that month. The first was a float trip with my dad down the Caney Fork. We spent a considerable amount of time teaching him to both cast and to set the hook, but once that was accomplished things went quite well. Late in the month, around guide trips and other things that kept me busy overall, I had a banner day fishing for smallmouth on a Cumberland Plateau stream that yielded my largest small stream smallie to date. June was busy enough with my guiding that it tied for the month with the second fewest blog posts. The guiding went quite well, however, with a Father's Day guided float trip seeing a big trout landed on the Caney Fork. In July, we received a much needed shot in the arm with rain finally falling after an extended period of low flows in the mountains. This cool deluge brought down stream temperatures, boosted flows, and got the fish interested in feeding heavily again. One of the highlights of the year guiding was having a return client nail a big brown trout on a terrestrial in the Smokies. We were both really happy about that! The streamer theme for the year really took off in early August. A change of plans had my cousin and his father-in-law throwing streamers on high water on the Caney. We found some willing trout and some big ones at that! This fish tied for my largest of the year although I think my Yellowstone trout took the top honors for several reasons. 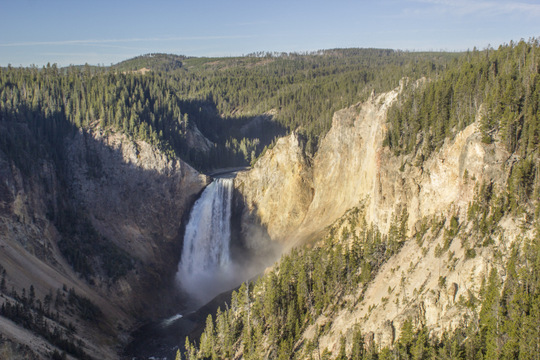 Speaking of Yellowstone, the last two weeks of September were dedicated to a long anticipated fly fishing trip to Yellowstone. I camped and fished until I was tired and ready to go home. In fact, I still owe you some posts on my trip there! The best day of the whole trip from a catching standpoint happened early, on the second day in fact. It began with epic fishing for cutthroat trout and finished with the big brown trout that I had travelled all that way to catch. 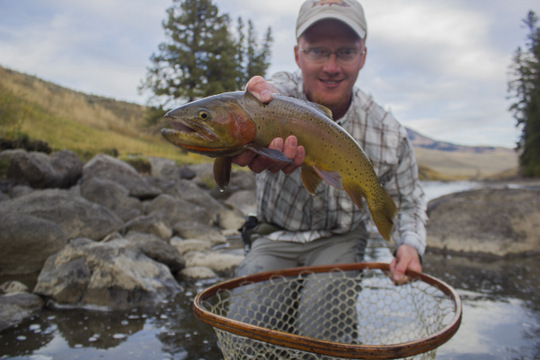 I returned from Yellowstone to a busy guide schedule in the peak of the fall fishing season. This was a great October for fishing across middle and east Tennessee. Float trips on the Caney saw some of the lowest numbers of the season but we still saw quality trout including this big rainbow. Fly fishing in the mountains was excellent. Fish were rising to dry flies well but also taking patterns like my Isonychia Soft Hackle like there was no tomorrow. 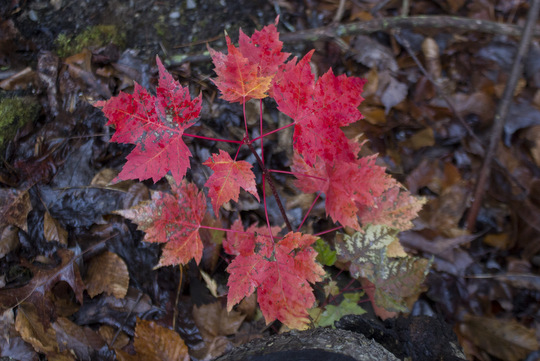 The fall colors were as good as I can ever remember. This good fishing continued into November and then December, almost like fall had never ended. The leaves were off the trees but the fish kept eating like it was October. 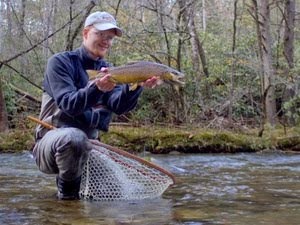 In fact, the largest fish caught on a guide trip this year came in early December in the Smokies. 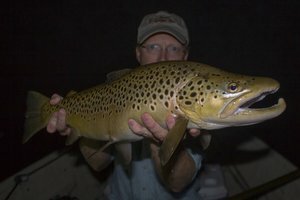 This is actually a very good time to target large brown trout in the Smokies, but we admittedly got lucky since we were not sight fishing to this bad boy. What a great big brown trout! With the holiday season came rain. Lots and lots of rain. In fact, I unfortunately had to cancel guide trips this week with high water dominating in the mountains. Better to cancel a trip though then to take someone's money and spend the whole day looking for fishable water or at least that's my opinion. In between guide trips, I still found a few fish for myself to catch as well! As we move into the near year of 2016, I'm excited to see what is in store for me, Trout Zone Anglers, and fishing across middle and east Tennessee. I'm currently taking bookings well into spring 2016 so if you are hoping to spend a day on the water with me in 2016, book the trip soon. I can tailor a day on the water to suit your goals. If the adventures I had in 2015 look like something you would like to experience, then email me at TroutZoneAnglers@gmail.com or call/text (931) 261-1884 to book your day on the water. *Note that try only corresponds with actual achievement some of the time. 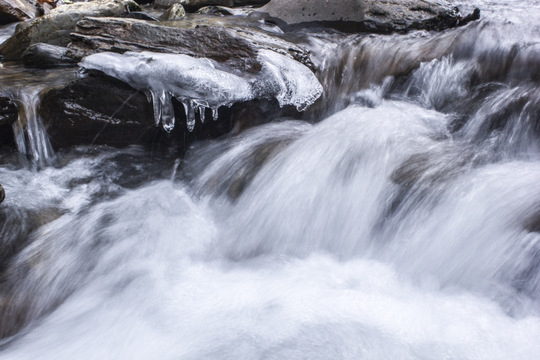 A couple of weeks ago, I addressed the current El Nino as well as what effects it might have on winter fishing in the Smokies and across our region. One of the points I emphasized was the idea of temperature trends. Just last week, on one of my guide trips, I experienced a new example that just confirmed, at least in my mind, the importance of the general temperature trend. We had been fishing several different sections of the Park. I did not expect particularly good fishing, especially early in the day, because water temperatures were between 39 and 41 degrees. Generally that signals poor fishing in the mountains. However, the cold snap was about done and the trend in water temperature was up. Our day was pleasant with plenty of sun early and the water temperature rose accordingly. Not only did we catch fish early, but we caught a good number of fish. Late in the day, the guy that I had out fishing wanted to see some different places to fish. This is normal on days when I have anglers who want to be introduced to fishing in the Smokies. I explained that I could show him some brook trout water but that we shouldn't have our expectations set too high. Ice on the rocks did not give us any extra hope, but this was more about learning how to fish so he could come back under better conditions. Surprisingly, we missed some nice fish including a colorful brook trout and got a decent rainbow trout on a dry fly. The water was 39.5 degrees when I checked. 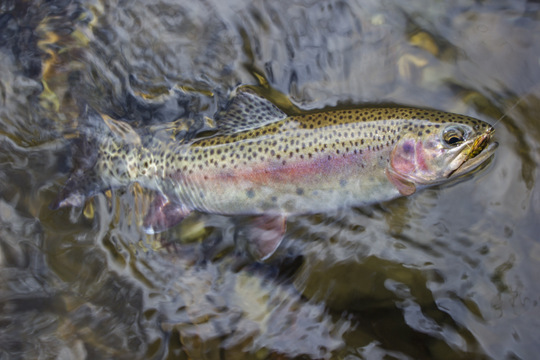 It is very important to remember that trout across the mountainous areas of the western US are routinely caught in very cold water during the winter. I'm talking about water full of slush and ice floes cold. Here in the southeast we are spoiled to be able to fish year round and generally do so on ice free streams, but remember that even when it is cold, the fish still have to eat. Instead of cold temperatures, this December has brought warmth approaching or surpassing recored levels at times. 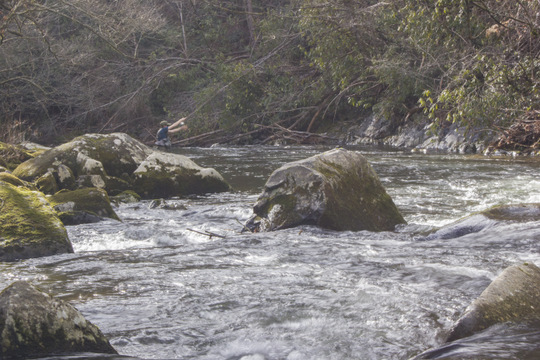 While it is easy to get caught up in wishing for winter, the warm weather has been a great thing for anglers in pursuit of trout on the freestone streams of the Great Smoky Mountains. 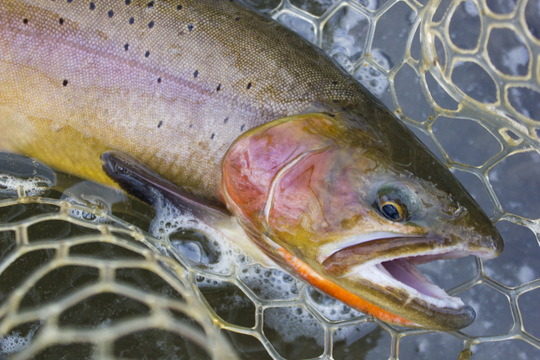 December fly fishing has never been better unless you want to target large trout. While the overall numbers of larger fish are down, there are still some to be caught. Winter fly fishing often loses the social element of warmer months because it is simply too cold to sit around and B.S. about past fishing glory. This year has been the exact opposite. In fact, the other day, a buddy and I sat happily by Little River watching yet another friend slowly work his way through a nice hole. I wasn't even wearing a jacket over my short sleeves. The waders weren't even necessary although somehow I would have felt foolish to skip them. In short, while locations across the west are over 100% of average of snowpack for this time of year, places here in the east of been simmering, but the fishing has been accordingly great. My favorite personal fishing story from this December happened just the other day. I had already attempted to cast to one rather large brown trout but had failed in my endeavors by spooking the fish. 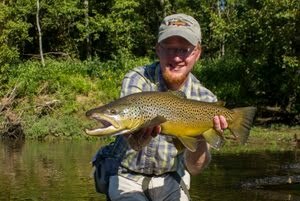 That pool rewarded me with a consolation brown whose colors almost made up for the blown larger fish. Further up river, another pool offered a shot at another quality fish. Definitely a lot smaller than the spooked fish, it was nevertheless a nice trout. Based on its location in the pool, I was confident that I had located a slightly better than average brown trout. My buddy Jayson agreed to maintain his vantage point while I slipped below the rock wall for a try at the fish. Having just fished through a section with a trout in seemingly every spot where I expected one, my confidence was flying high. So confident that I was a little surprised when the first perfect cast did not catch the trout. With nicer fish, your first cast counts for a lot, so I was concerned that somehow the fish had spooked. Thankfully, I could call the Instant Replay official upstairs my buddy Jayson who confirmed that the dark shadow was still a fish. Several subsequent casts convinced me that I wasn't getting deep enough and needed to adjust my drift. There was already enough split shot on my flies to sink a battleship and the fish wasn't sitting too deep. Reaching back with the nine foot five weight Helios for a little extra, I dropped the next cast another three feet further upstream and started yet another drift. The flies drifted into the trout's window and it ate just like it was supposed to. Textbook sight casting. Merry Christmas to me. You see, sight casting is, in my opinion, the pinnacle of fly fishing. Sure, I love streamer fishing as much or more than the next angler. 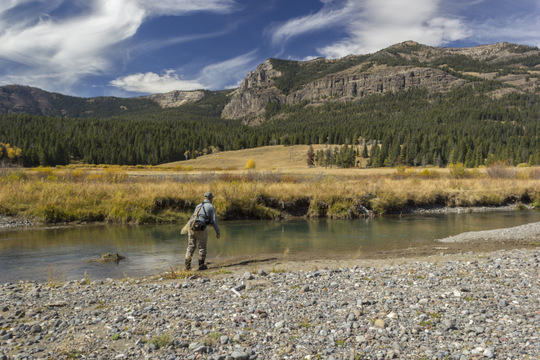 The tip top of that pinnacle, of course, is sight casting with dry flies, but a good angler adapts to the conditions at hand and that trout had no interest in surface offerings. The fly that fooled this nice fish was a #10 Tellico nymph, the same fly that 95% of my fish for the day came on. I've gotten away from fishing this pattern over the last year or two and that is unfortunate. It really is a great fly. Did I mind that it wasn't a 20 inch brown trout? Of course not. You take what the stream offers and would be a bad sport if you asked for more. This rainbow trout was somewhere around a foot long, making it a very nice fish indeed. Rainbows over ten inches don't come around particularly often. In any given year I'll catch at best a handful of 12 inch plus rainbows in the Smokies, so this was a good fish for what may be my last day on the water for 2015. The fish came to hand after a glorious aerial display making it all the more memorable. The rest of the day was anticlimactic. Both Jayson and I caught some trout, but the best action had already passed. Finally, we ended what was a long day with the agreement to get out again sometime soon on another piece of local water that we have talked about for a while. If the weather holds, that will hopefully happen in the first week or so of January. Just like that, we move from December in the Smokies to January in the Smokies...and February, and March...and the first spring hatches. Just like that. As the days rolled by, pent up energy was building far to the north. Local hunters and anglers have likely noticed something is amiss, but only a few realized the severity of the situation. True, a few advance scouts had infiltrated the region, but in reality their numbers were a fraction of what should be. Was there a bottleneck or traffic jam? Perhaps someone had called off the invasion. Over the last two weeks, a few more have been churning their way through. Better two months late than never I suppose. 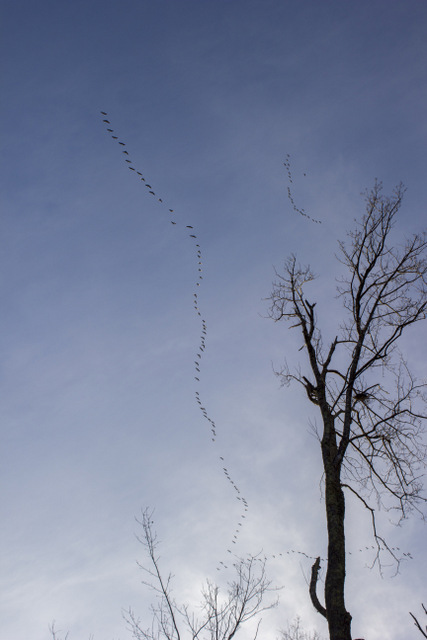 Two days ago, I heard the distinct symphony of the winged invaders. Glancing up, I smiled. They are coming after all. I suppose this means we might have winter after all. Apparently someone thinks so. I noticed something in the news about energy stocks rising due to expected cold weather boosting the demand for natural gas. Some cold weather would be nice. I went for a hike on Christmas Eve day and wished I had worn shorts. Christmas Eve!!! When it should be cold. Oh, and I saw a snake. This all happened the day after tornadoes ripped across parts of Tennessee and Mississippi. On Christmas day we set a record high temperature here in Crossville and also a record for the most rainfall on December 25. What is going on? Everything this year has been behind or so it has seemed. We may still have a good winter in store. 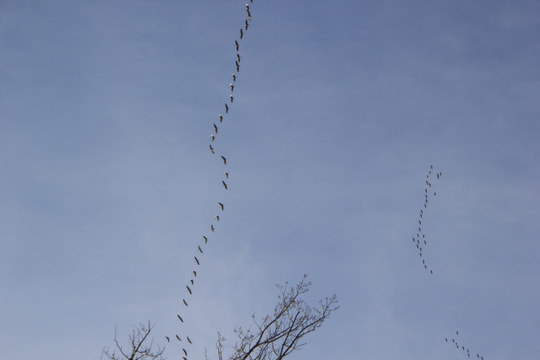 The sandhill cranes invading the South seem to think so. First of all, thank you to everyone who participated in this year's Christmas giveaways. It was fun coming up with some creative items, and I would especially like to thank Jayson Alexander for contributing his artwork to the giveaway. If you need someone to do some graphic design work for you, or want to commission a great piece of art, contact Jayson for more info via email at jaysonalexander4@gmail.com. In addition, if you are interested in a canvass print of the photograph I'm giving away, let me know via email and we'll discuss the particulars. Finally, what you have all waited for. First, the winner of giveaway one featuring this fine work of art. Using the random number generator and ranking everyone based on the order I received your emails, the winner is.....Will Neblett! Congratulations Will and Merry Christmas from the Trout Zone. Second, the winner of giveaway number two featuring an 11x14 canvass print of a beautiful southern Appalachian brook trout. Again, using a random number generator following the procedure outlined above, the winner is....Don Tummons! Congratulations Don and Merry Christmas from the Trout Zone. Finally, the last giveaway was something that any fly fisher can always use. In fact, you probably can never have too many....flies. That's right, the lucky winner of this giveaway gets two dozen of my favorite subsurface patterns for fishing in the Park. Using a random number generator again, the lucky winner for this giveaway is....Travis Williams! Congratulations Travis and Merry Christmas from the Trout Zone. That wraps up the Christmas 2015 giveaways. I want to thank everyone who entered as well as those who helped spread the word. Coming up in early 2016 will be some more great giveaways that I know you will not want to miss. In fact, the best will only be available to those who are subscribers to the Trout Zone Anglers Newsletter. Subscribe below to make sure you do not miss out. Merry Christmas! Thank you for being here throughout 2015. I'm going to delay the final drawing for the Christmas giveaways for another few hours to give a few more people a chance to enter. Check back late this evening or tomorrow as the final drawing will be this evening. I'll be shipping the items out early next week so the winners should get them by New Years (with a little luck). 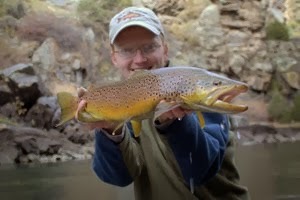 First, thank you so much for reading my blog and supporting the Trout Zone. These giveaways are just a small way to say thank you for taking your time to stop by. The third and final Christmas 2015 giveaway is something that will benefit each and every fly fisherman except for the dry fly purists out there. If you are in that latter category then I apologize, but you will not enjoy this one. 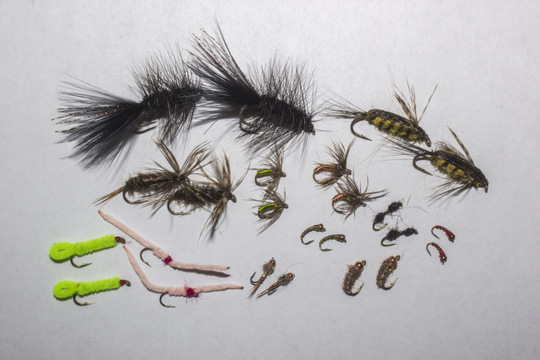 Up for grabs are two dozen of my favorite subsurface flies for fishing in the Smokies. All were hand tied by yours truly. Included in the mix are the flies that caught the largest and the second largest trout landed by people on guided trips with me this year. You might be surprised by which ones they are. When I say subsurface flies, it includes traditional nymphs, soft hackles, midges, caddis pupa, and wooly buggers. There are even some terrestrials thrown into the mix. Whoever wins this will be winning some of my favorite flies for fishing in the Smokies, but there are also some flies that will serve you well on the tailwaters or even out west. In fact, one of the flies I included saved the day once for me on the Big Thompson River in Colorado. Also, you will discover that while I'm not a particularly good fly tyer, these flies will catch lots of fish. Need advice on fishing these flies once you win? Then shoot me an email or book a guided fly fishing trip. The winner for all of these contests (contest one and contest two) will be drawn on Christmas Eve and announced here on the Trout Zone at that time. Winners will also be contacted via email. To enter, please send an email to TheTroutZoneContests@gmail.com and use "Giveaway Three" as the email subject line. Simply tell me in the email where you plan on fishing these flies. A winner will be drawn by a random number generator on Christmas Eve day. Shipping included to continental US. Looking for more great giveaways? There will be one YOU DO NOT WANT TO MISS coming up in another week or two but this giveaway is only for subscribers to the Trout Zone Anglers Newsletter. Not signed up? Then use the handy sign up form below. You will not receive any spam from me, only a newsletter on occasion that features fishing reports, how-to, photo essays from fly fishing trips, and the occasional giveaway or special just for subscribers. This year, I decided to get into the holiday spirit and do a Christmas giveaway. Then I considered that maybe more than one giveaway would be nice. With that in mind, here is the first item in this year's Christmas giveaway. 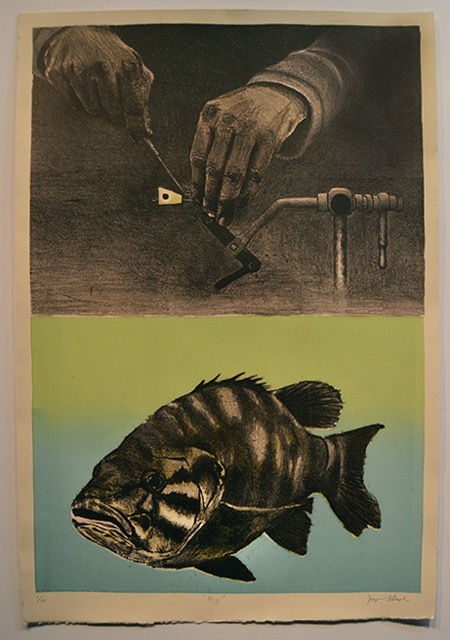 Up for grabs is the beautiful piece shown below, a lithograph titled "Pop" and specially numbered. Instructions on how to enter can be found below. Local artist Jayson Alexander generously agreed to donate a print from his most recent project. He is an artist who fly fishes and incorporates this sport we love into much of his work. Jayson said this about the following piece: "The print is a 15x22 lithograph titled “Pop” print 1/10, so there are only 10 in existence with no chance of other originals being made identically through the lithographic process." If you don't want to wait to find out if you win, or if you don't win but still want one of these fantastic prints, you can contact Jayson directly via email at jaysonalexander4@gmail.com or call/text (865) 705-3702 for pricing and to order. You can also check out his Facebook artist page. To enter, please send an email to TheTroutZoneContests@gmail.com and use "Giveaway One" as the email subject line. Simply tell me in the email why you would like this unique work of art and where you plan to display it at. A winner will be drawn by a random number generator on Christmas Eve day. Shipping included to continental US. Be sure to share this with all of your friends as well! Coming up will be more great items so make sure you enter into each drawing. 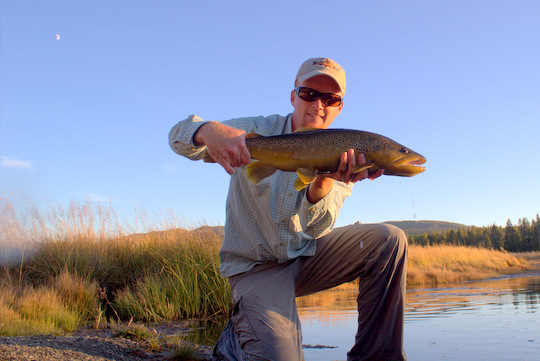 One of the benefits (and probably curses too) of writing about fly fishing is that you choose what to share. Have a bad day on the water? No problem. Just don't tell the masses. Just share those good days. However, anglers of all skill levels still have slow days, and being a writer doesn't magically make you immune to bad luck, poor conditions, and the least discussed but probably most prevalent operator error. Once you have been fishing for over 25 years and fly fishing for 20+, there are also self-inflicted slow days. Take my recent musky floats for example. I have now spent two full and long fishless days, happily casting a heavy rod with gigantic flies all in the hopes of catching a fish larger than any of the trout I have ever caught and with far more teeth. Simply removing the fly can be a dangerous game where losing fingers is a distinct possibility. When I say self-inflicted, I mostly mean that I chose to go on those musky floats, but of course there is also the angle where throwing flies at these monsters is not the easiest way to go about catching them. Then again, that is at least 77.7% the point. Same thing with fly fishing in the Smokies. I've been around these creeks and small rivers long enough to have a good idea on how to scare up a few fish when necessary. So on those days where I hit the water and stubbornly stick to my streamers, you could say the slow fishing is self-inflicted. Some days are just the result of the fact that I don't know it all yet. Those are the days that keep me coming back again and again. Have you ever noticed how slow days do one of two things? Either they make you feel like you are slowly losing your sanity as you beat the water into a froth trying to drum up a trout or two, or else they cause you to slow down and appreciate some of the additional benefits to getting outside. Two weeks ago or thereabouts, I took a full day off to take myself fishing. Even as a guide who spends a lot of time on the water, I'm still excited to go fishing for my own enjoyment. This day was no different. The spawn was mostly wrapped up with a straggling pair here and there. The brown trout were definitely hungry and aggressive, a combination I would take every day if possible. Rain the night before had bumped up the water levels to something just short of perfect for streamer fishing, but higher than I would prefer for good nymph or dry fly presentations. In other words, I had an excuse ready to go in case I didn't catch many fish. A super secret streamer came out along with a large nymph, both ending up in tandem on the end of my leader. I hit the water full of anticipation. Several large fish had been located over the last few weeks, and I just knew that it was the right day to catch them. The first spot got me thoroughly warmed up with several aggressively chasing fish. One in particular even graced the end of my line and paused just long enough for a picture. Always document that first fish, assuming you want photographs. You never know when you'll catch another. Moving up to an area where I had spotted a large fish two weeks prior, I was disappointed without even getting so much as a follow. Same thing with the next spot. Finally, the third spot produced follow, after follow, after follow...I think you get the point. Some good eats too, but I missed every single one of them. Yep, bloggers and guides have bad days also. On my way back to the car after this third stop, I noticed something. Fall had not quite passed by. 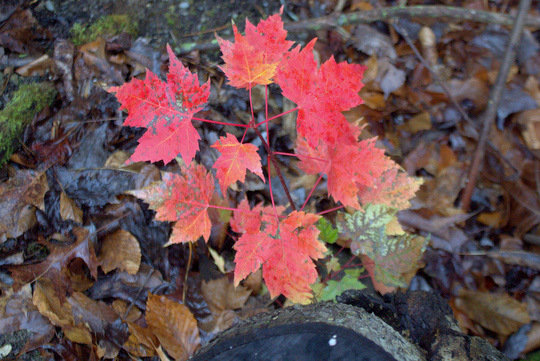 One little maple tree was still valiantly holding on. This was just the soothing distraction I needed as my expectations were taking a thorough beating. The next spot or two produced some more heart stopping hits, but sadly with the same results. This was just not my day. And so, as has happened many times before and I'm sure will happen again, I approached the end of the day thankful for one fish. With the light fading fast and the fish somehow missing my hook, I took a drive down Little River and over to Tremont (Middle Prong of Little River). 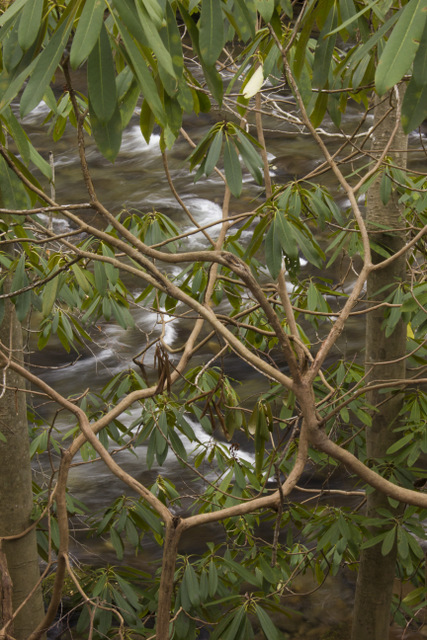 The scenery was perfect, the roads were nearly empty, and I made an interesting discovery: Middle Prong was flowing much higher than Little River. Unsure of the significance of such a discovery, I nevertheless drove as far as I could up this popular little stream until the light simply grew too dim. My last stop required a final picture. If you have fished here, then you know how high the water really was. 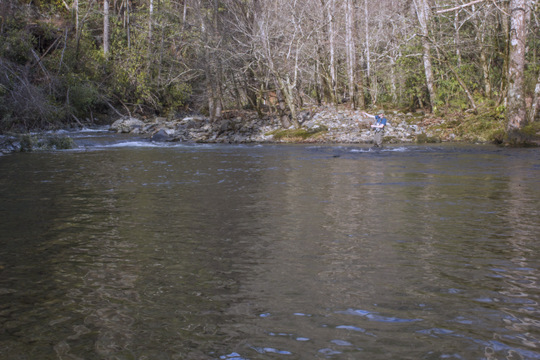 Fly fishing in the Smokies during the winter months us generally a hit or miss proposition. Some years are better than others for winter fishing while others are downright tough. Last winter, for example, and the winter before were both cold with warm weather a rarity. This year is shaping up to possibly be the exact opposite. Most likely we have El Nino to thank for it. Generally, El Nino years result in more warm stretches which helps to keep overall water temperatures elevated compared to winter norms. 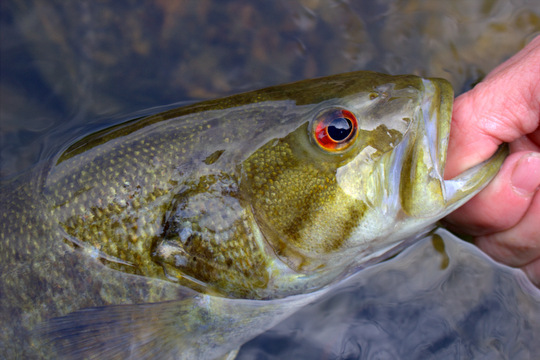 The quality of fishing is directly correlated to water temperatures. That is not to say that fish cannot be caught in cold water. On the contrary, the fish still need to eat but their instinct to feed is triggered by environmental conditions, especially abundant food. When it is very cold, most fish will not move far to seek out food. In cold months this equates to a flurry of activity in the warmest part of the day when a few midges, winter stoneflies, and perhaps some caddis flies all make an appearance. Another important factor involving water temperature is the temperature trends. Last week, we saw an excellent example of this. The water temperatures were running between 42 and 44 degrees. 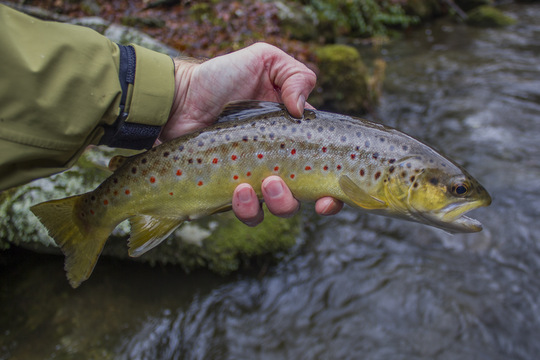 Conventional wisdom would suggest that fishing would be slow under such conditions, but on the contrary we had a fairly good day for winter with one lucky angler catching a trophy brown trout by Smoky Mountain standards and everyone, including a first time fly fisherman, catching at least some fish. Why was the fishing good on this particular day? The temperature trend. You see, the previous day saw the water temperature get up to around 43 degrees (as recorded on Little River at the Park boundary just outside Townsend). However, warm overnight temperatures kept the water temperature from falling. That meant that the next morning, instead of starting at 39-41 degrees after the expected night time temperature drop, we were already starting at the previous day's high temperature. The fish responded enthusiastically both to the improving conditions and to our flies. This winter should see good fishing more often than not. El Nino will bring more warm weather to the region than we saw the last two winters. One of the best parts about winter fishing is having the water to yourself. Sure, beautiful and unseasonably warm weekends are going to have some people out enjoying nature, but for the most part you can find your own piece of water even on the weekends. Can you fish on a weekday? If so then expect to have it more or less to yourself. The only possibly fly in the ointment is the potential for high water. We will probably have to deal with high water on several occasions over the next few months, but then that is part of winter fishing anyways, at least in these parts. I plan on taking full advantage of the El Nino Effect this year and get out throughout January and February even on some small streams if possible. Today would have been a great day to be on the water if I hadn't of been busy. Water temperatures on Little River are in the mid 50s which is more like you would expect in October. I'll most likely get out a day or two this upcoming week. Also, I'm hoping to fish for brook trout a little more this upcoming year. Okay, maybe a lot more. 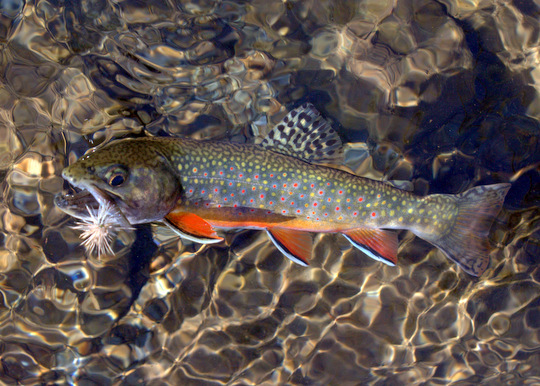 My goal for the next year is to catch a brook trout a month. I'm hoping to accomplish this on a dry fly to make it even better but will not be above using a dropper if the fish aren't looking up. I might even do it on one of my new Tenkara rods to add another level of novelty. Don't worry though. I'll still be out chasing the big browns on occasion as well! 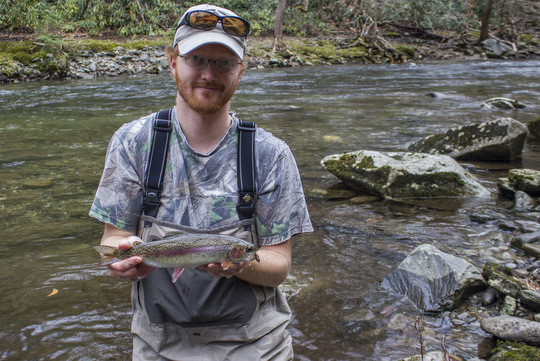 So, in summary, I expect good fishing to happen more often than not in the Smokies this winter. There will definitely be some cold snaps and probably even some frozen precipitation, but there will be some great fishing on occasion as well. We also probably have a better than average chance of starting the spring hatches early this year so stay tuned for more on that. 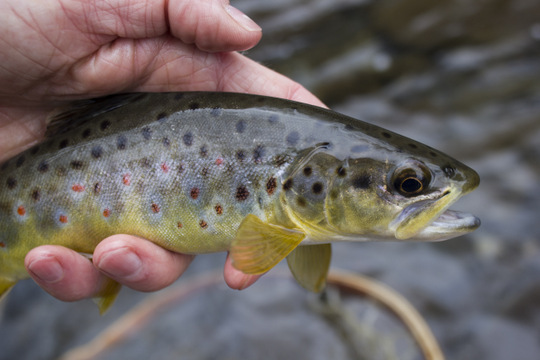 Catching large brown trout in the Great Smoky Mountains is never guaranteed. Far from it in fact as large brown trout are definitely around but rarely hooked. For most anglers, catching one is the highlight of their year at minimum and sometimes even for their life. 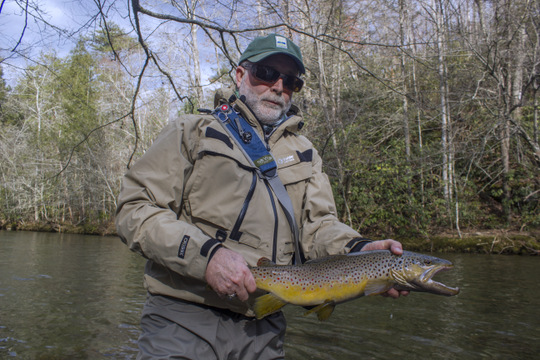 Yesterday, one lucky angler was fortunate enough to land one of the highly sought after big brown trout on Little River in the Smokies. I had some guys from up north down to fish. For their first full day on the water, they hired me as a guide to help show them around and get them oriented to how we fish here in the Great Smoky Mountains. The morning started off quickly and it was not too long before each of them had caught their first Smoky Mountain trout including one who was fly fishing for the first time. This time of year, that is about as good as you can hope for so I was already quite happy as the guide. We took a good lunch break and after getting fueled up for an afternoon of fishing, we hit the water again heading straight for a nice long pool that has room for more than one angler to fish. I got one angler started in the bottom of the pool after pointing out a few specific features with the instructions to fish thoroughly around those areas. Then I took the other angler upstream to fish the head of the run where I hoped we would find some trout feeding in the slightly faster water. Before we had even really gotten into a rhythm fishing, the first guy yelled, "I think I have a good one!" Indeed he did and when I saw that golden flank flash in the sun I was all out sprinting down the bank with my net at the ready. Luckily all of the knots and 5x tippet held as they were supposed to and he did a fantastic job fighting the fish on his 8' 6" 4 weight rod. Before we even really had time to process what was happening, 22 inches of buttery brown trout was in the big net. 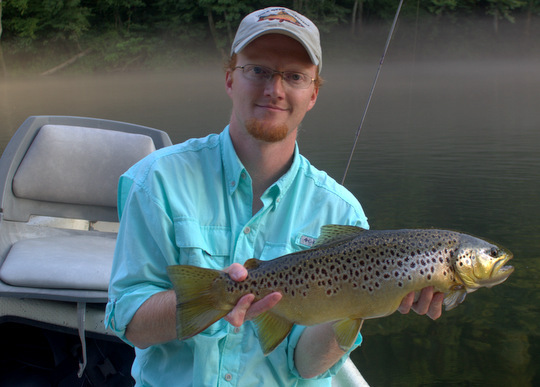 Great job Steve and congrats on a memorable wild Smoky Mountain brown trout! Of course, a few pictures were necessary after which I tried to impress upon him how special of a fish this was for the Smoky Mountains. These fish don't come around every day and often not even every year, especially for most anglers. Applying good techniques and the ability to read water will go a long ways though towards eventually achieving the goal of catching one of these beauties! If you are interested in a guided fly fishing trip in the Smokies, please contact me at TroutZoneAnglers@gmail.com or call/text at (931) 261-1884. Please note that the Trout Zone blog has a new web address! The new and correct address is www.thetroutzone.com. Please update your links and bookmarks accordingly. Thanks! Anyone who has read the Trout Zone for any length of time knows how much I enjoy streamer fishing. I've had some long slow days that involve NOT catching fish, but when you do catch that big fish it is so worth it. 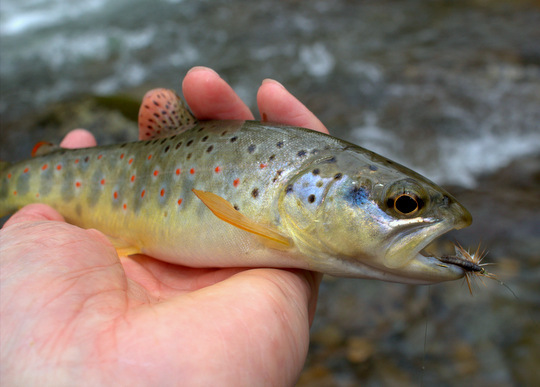 Small stream streamer fishing is something that most people do not even consider, but that should not be the case. 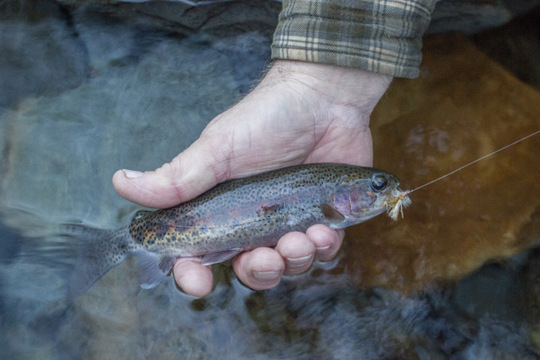 In many ways, streamers are even easier to fish on small streams. Want to learn some tips and tricks to get you started? Check out Brandon Bailes' article over on the Flymen Fishing Company site. 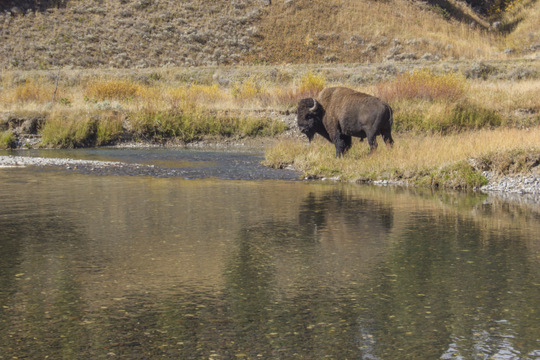 After a fantastic day on the Lamar River (click the link and read to get caught up if you have not already done so) on just the second day of my Yellowstone 2015 trip, a return was in order. After a fairly tough day with just a few trout to hand, I wanted my buddy Kevin to experience some truly great Yellowstone fishing. As I told him, when you come to Yellowstone you need to fish for cutthroat trout. I figured that we would have a good time and catch some nice trout in Paradise Valley. Between the Lamar which had treated me so well two days prior and also Soda Butte and Slough Creeks, we had plenty of water to keep us busy for the day. On the way over, we had to pass Roosevelt. 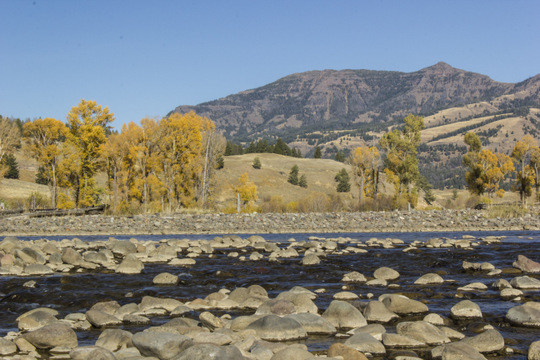 Just south of that junction was the Yellowstone River falls area. We quickly detoured to see that as the day needed some time to warm up. The trout would be a little sluggish until later in the morning anyway. Nevertheless, our visit to the Lower Falls was brief as thoughts of large cutthroat kept nagging at us. 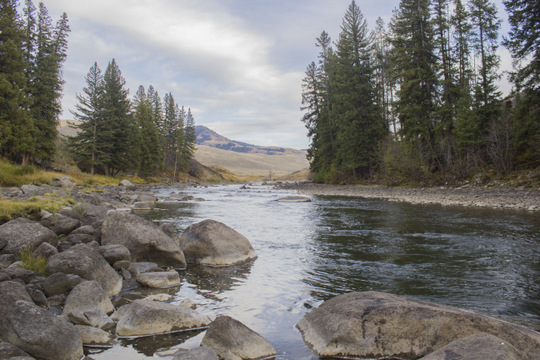 Upon arriving in the Lamar Valley, we slowly drove up to Soda Butte Creek. Lots of anglers were already on the water throughout the valley so bypassing the Lamar River was an easy choice. 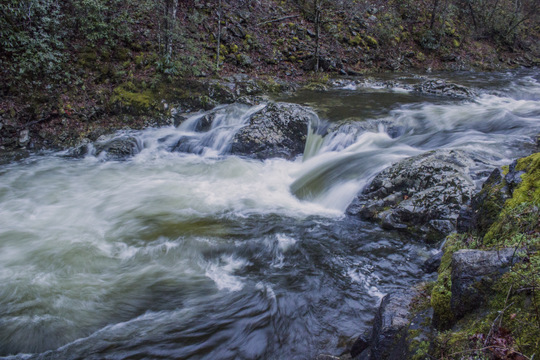 Finally, we found a good pulloff near the Pebble Creek Campground. Kevin was anxious to get started and wasted no time rigging up and heading for the stream. I, on the other hand, continued my now established tradition of a stream side breakfast before fishing. By the time I was finished, Kevin had worked through at least a couple of good looking runs without even spotting a trout. Just as I joined him on the water, he was working up to a particularly good looking pool. His first cast was on the money and a big cutthroat ghosted out from beneath a fallen pine tree to take a look at his hopper. Both of us got excited but that didn't help convince the fish to eat. A dropper was added to the rig but that still didn't put any fish in the net. We continued working upstream, seeing a few fish here and there but not particularly great numbers. It was obvious that the fish had been pounded all summer. Gullible was not in their vocabulary on this particular day. Thankfully, the scenery more than made up for the slow fishing. After missing some nice fish and in general getting tired, it was determined that we should head back down the valley to the Lamar and try our luck there. I remembered all too well how it had fished so recently and was convinced we would find some fish if we just found some open water there. Sure enough, the fish were there and easy to spot I might add. The water had cleared even more since I had fished it and now the fish were very cautious in the low clear flows of autumn. I had indeed hit it on the perfect day and was appreciating that fantastic fishing more and more by the day. Still, finding fish is at least half of the battle so we were in business with trout that we could spot. 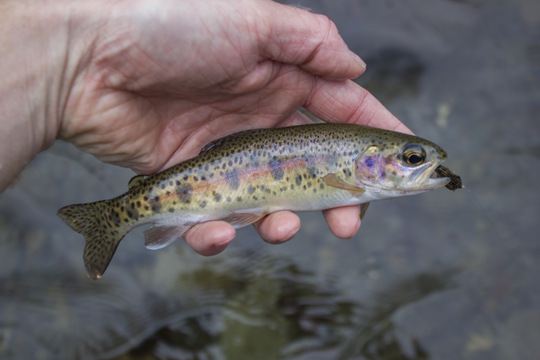 With time and persistence, trout started coming to hand. Not in the mass quantities of two days prior, but better than going fishless for sure. Hoppers were still getting it done although there were some mayflies on the water as well. 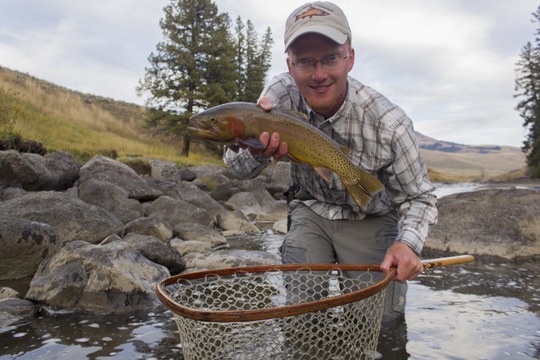 Kevin got his first Yellowstone cutthroat right at the junction of the Lamar and Soda Butte. He had spotted big fish cruising a large flat there, rising to various bugs including mayflies and terrestrials. After breaking the first two off, he was happy to land this gorgeous fish. Nearby, I also caught some trout and enjoyed the sweeping vistas. The low water was all too obvious though as you can see in the picture below. By this time, the sun was moving well towards the horizon and we had a decision to make. Leaving and heading back towards camp would get us there in time for about an hour of fishing in the evening on the Gibbon River. My experience in catching a big brown trout earlier in the week definitely tempted us to take this option. On the other hand, it was at least a good hour to get back and we would be burning valuable daylight to do so. Eventually, we decided to stay on the Lamar and try some different water. 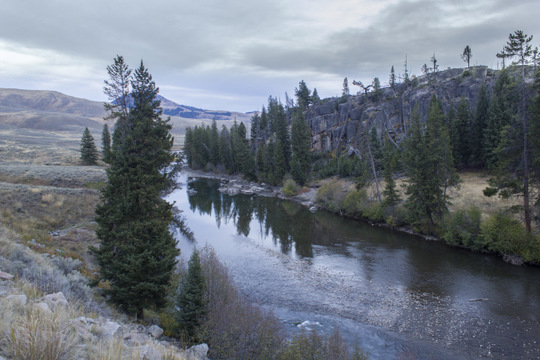 As the river leaves the wide open valley it descends into a short canyon stretch. On both ends of this canyon are some rather large pools I have always wanted to fish. We found an open stretch and found a place to scramble down the steep slope. With daylight getting weaker as nightfall approached, Kevin decided to try streamers. I, on the other hand, noticed some spinners on the water and decided that an appropriate imitation fished behind my hopper might be good. Both of us found some good success! That just happens to be one of my favorite things about fly fishing. 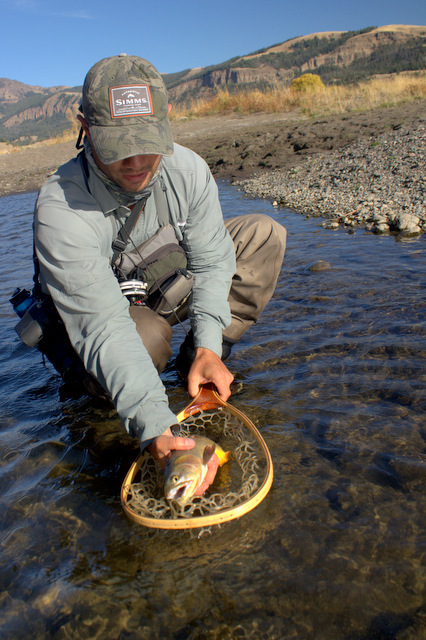 If you are persistent, you can usually scrounge up at least a few trout on whatever method you choose. As the sun sank, the low even light made for some great photo opportunities. The mood was enhanced by pronghorn antelope coming down for an evening drink just downstream from me. I almost expected a wolf or grizzly bear to make an appearance and complete the scene. It is probably best that neither showed up though. It was a long run uphill to the supposed safety of my car.